March 17th – What else do we remember? In 1776, the American Continental Army under General George Washington forced the British under General William Howe to leave Boston’s shores. “And, unlike so many countries, the United States has never had foreign troops on its shores ever since!” my father would add to our family history lesson that day. Also omitted from my formal education was what happened to Massachusetts citizens at that time who were NOT caught up in the revolutionary fever. Our history books called them Tories or Loyalists. I only knew that they fled to Nova Scotia and perhaps back to England—that’s all our books and teachers said. However, some citizens weren’t so sure it was prudent to go into a war with England. Not all were loyal to King George. Many were highly educated and committed citizens of the colony and hadn’t made up their minds. Others sought rational discussion and hoped diplomacy would settle the issues. Given the volatility of the time, however, many of these citizens suffered greatly: losing their homes and property, being forced to hide in Boston under horrible conditions or being shot or lynched. I’d only heard the phrase ‘tar and feather’ in relationship to slavery, the abolitionist movement, and Civil War, but I had no idea that this barbaric practice was also done to those colonists of 1775-6 who had a different opinion about a war with England. If it hadn’t been chosen by our library book group (with a focus on history, biography and historical fiction) to read last month, I would not have known about it. We’d already read books on the American Revolutionary War by many of today’s leading historians and biographers. This book was written before I attended elementary school, but the topic should have been discussed in my high school US history courses, and certainly should have been on a recommended reading list for my college liberal arts classes! If you’re interested in this part of US history or preparing a teaching block on the American Revolutionary War, this is a book you should not neglect to read. Be aware that it is around 1000 pages—daunting for me and many readers, to be sure, but it’s worth it! 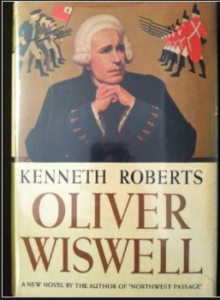 Just as contemporary books about slavery and abolition today reveal the extent our US history books have neglected to inform us of the existence of slavery in the northern states, “Oliver Wiswell” (1940) illuminates other lesser-known facts about one of the most significant periods in America’s colonial history. My next post will review a children’s book about the bookseller turned soldier and patriot, Henry Knox. This entry was posted in News and Announcements, Pam's Perspectives and tagged Book reviews, History, Holiday, New England, Reading. Bookmark the permalink. Both comments and trackbacks are currently closed.